Down 13-0 after being totally dominated by the Dawgs in the first half, “Groucho’s Boys” looked as dead as Dickens’ Jacob Marley. But during the intermission, St. Nick, who now shares with Paul “Bear” Bryant the ownership of a record-tying six national championships, made one of the gutsiest decision in the history of the sport. Desperately searching for a spark, Saban, in a “welcome to the big-top” moment decided to pull his two-year Alpha-dog starting QB Jalen Hurts, the talented producer of an unimpeachable 25-2 record, and send out a true-freshman lefty and Hawaiian native, QB Tua Tagovailoa, who had yet to play any meaningful minutes in Tuscaloosa to try and salvage a championship season. 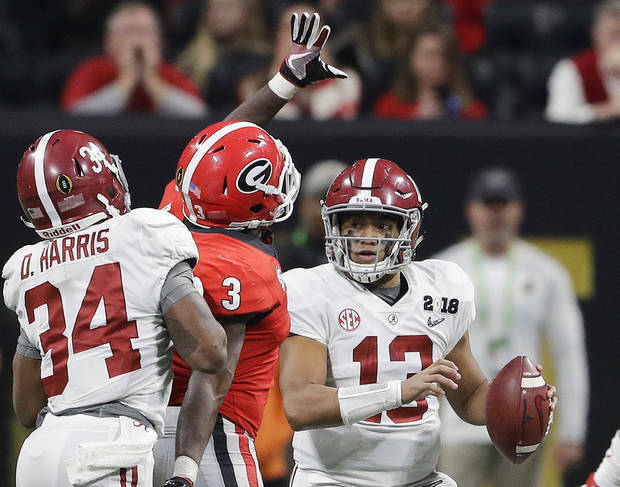 “I just thought we had to throw the ball, and I felt he (Tagovailoa) could do it better, and he did,” said Saban as simply as adding one and one. Except for the Redwood sized stakes riding on the outcome. The move proved to be as brilliant as anything former World Chess Champion Bobby Fischer could have envisioned sitting across from Boris Spassky. DeVonta Smith which amazingly gave Alabama not only its only lead of the night, but the national championship to boot. It will be a pass that will live forever in Alabama folklore. The win for the ages, gives Alabama its fifth title in the last nine years, reaffirms the Crimson Tide’s place on top of the “Title Town” mountain, and leaves St. Nick a perfect 12-0 versus his assistants, in a run of excellence only the rarest of artists; Fischer, Mozart, Michelangelo, or John Williams have tasted, and beware out there in college football land, there is no end in sight.